Acoustic ecologist and bodysurfer Gordon Hempton on the “presence of silence” and the “laundering” powers of the Pacific. “I was a bodysurfer long before I became a nature-sound recorder,” says acoustic ecologist Gordon Hempton in TSJ 25.3. “And I didn’t really put the two together initially. But looking back at my life, I can see how surfing certainly contributed to what I do now professionally. We cannot see the sonic world, but when we watch a swell develop it behaves exactly how sound behaves in our environment. Seeing how waves refract and work with each other helps me do my job. It shows me how if I sit in different positions, maybe just ten feet apart, I can put myself in a place to experience exactly the sound I’m looking for. In this vid, we tag along with Hempton for a recording session in Washington’s Hoh rainforest, and a bodysurf at nearby environs. 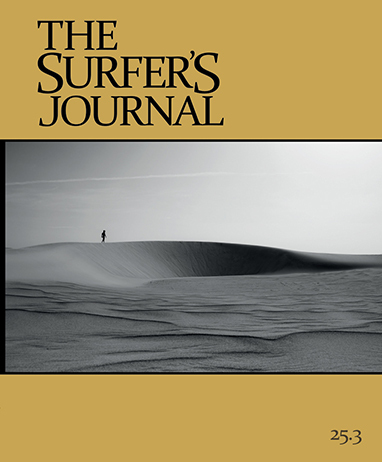 To read more about Hempton's surfing and sound tracking, pick up a copy of TSJ 25.3.